A submarine hydrothermal fluid discharge structure in Akureyri Bay, Eyjafjörður region, Iceland, was investigated by means of structural, geochemical, and mineralogical methods. Thermal and chemical gradients between the hydrothermal fluid and the subarctic seawater lead to an ongoing mineral precipitation. This process builds up hydrothermal chimneys of dozens of meters in height and they are still growing. The structural analysis reveals an internal stratification of the mineral precipitates at various scales from sub-micrometers to several decimeters. This stratification indicates random changes in the depositional system during the formation of the hydrothermal cones. Some mineral layers are characterized by a dominance of Si, Mg, and O. In contrast, others are dominated by Ca and O. However, the results of XRD analysis proved that the material consists mainly of a trioctahedral phyllosilicate of the smectite group, presumably saponite or stevensite. Additionally, aragonite and hisingerite could be present. The material is built up of numerous parallel tubes, which act as conductors in the hydrothermal chimneys. Consequently, a large amount of available pore space with pore volumes of up to 6 mm3 was detected in the sample by the porosity analysis. Due to its hot spot origin and position upon the Mid-Atlantic Ridge (MAR), Iceland is a predestined example for a volcanically determined depositional environment. Besides an exceptional amount of volcanic and volcaniclastic deposits, there exist many localities with intensive hydrothermal activity. Common features in subaerial strata are sulfuric gas emissions, hot springs, and mud pots, but submarine hydrothermal discharges occur as well. In the north of Iceland, intensive hydrothermal activity is known in the Tjörnes fracture zone, which connects the neo-volcanic zone of Iceland to the Kolbeinsey Ridge, the northern extension of the MAR (Rögnvaldsson et al. 1998; Riedel et al. 2001). Three hydrothermal localities within the Tjörnes fracture zone are known: south of Kolbeinsey Island, east of Grimsey Island and in Akureyri Bay (Fig. 1a; Stoffers et al. 1997, 2000; Hannington et al. 2001); the former two comprise high-temperature geothermal fields (Hannington et al. 2001; cf. Ármannsson 2016). On the Kolbeinsey Ridge, hydrothermal discharge at a water depth of 100–110 m produces precipitates of orange-reddish mud or yellow-reddish iron hydroxide (Lackschewitz et al. 2006). The Grimsey vent field comprises a large hydrothermal area with anhydrite mounds and chimneys at a water depth of about 400 m (Hannington et al. 2001). While on the Kolbeinsey Ridge the ground is made up of highly altered basalts, the Grimsey graben is filled with glacial sediments (Lackschewitz et al. 2006). These volcaniclastic materials are altered by hydrothermal fluids, which cause the replacement by or precipitation of sulfides, sulfates, oxides, oxyhydroxides, carbonates, and phyllosilicates (Dekov et al. 2005, 2008). In Akureyri Bay, hydrothermal fluids escaping from the 6 to 12 Ma old basaltic seafloor (Björnsson 1981; Björnsson and Saemundsson 1975) show chemical properties (meteoric origin, low mineralization, high pH values) and stable isotope ratios that are almost identical to those with similar temperature (50–100 °C) from other geothermal fields in the Eyjafjörður region (Kristmannsdottir and Johnsen 1982; Geptner et al. 2002). Quite special structures are the hydrothermal freshwater vents discovered and described by Marteinsson et al. (2001). These submarine cones, up to 45 m high (Fig. 1b, d), discharge hydrothermal fluids of pH 10.0 at a water temperature of around 70 °C. Their submarine discharge of SiO2-rich, mineralized water is quenched upon contact with the cold subarctic ocean water (Mg-rich), resulting mainly in the precipitation of smectite. About 50 different species of thermophilic bacteria and archaea were found in the submarine discharge (Marteinsson et al. 2001). Two different studies were carried out on the hydrothermal chimneys at Strýtan using different approaches. Marteinsson et al. (2001) first discovered and described the cones and focused on hydrochemistry and microbiological issues of the hydrothermal fluid. Geptner et al. (2002) provide a concise description of the clay mineralogical aspects and characteristics of the material and investigated the clay mineralogical properties of the material at sub-micrometer scale. In contrast, the focus of our study is set on structural investigations and the integration of geochemical, structural, and mineralogical results to conclude on the depositional system and its processes. The largest of the three cones is in the focus of the present work (Fig. 1b). These enormously large chimneys are built up of small-scale discharge structures (Fig. 1c, e, f). Permission was obtained to collect one rock sample of the small-scale degassing structures during dives at the major cone “Strýtan” at a water depth of 30 m (Fig. 1a, b). The aim of this study was to obtain a better understanding of the internal structure of the cones and of the forming conditions under which such silicates precipitate. This knowledge contributes to complete the knowledge inventory on the hydrothermal cones in the region and enhance a possible comparison to other sites in the future. The fieldwork included mapping and photo-documentation of the hydrothermal chimneys. All underwater investigations were carried out by specially trained scuba divers. The sample material was investigated for its structural, mineralogical, and geochemical properties using optical microscopy (thin sections), a macroscopic description of polished sections, XCT, SEM (also combined with EDS), XRF, and XRD. Thin and polished sections as well as powder samples for chemical analysis (<63 µm) were prepared. Scanning electron microscopy (SEM) analysis was carried out using a JEOL JSM-7001 F Field Emission Scanning Electron Microscope. Energy-dispersive X-ray spectroscopy (EDS) was performed with a BRUKER EDS, whereas for the XRF analysis a Spectro Xepos spectrometer was used. X-ray computed tomography (XCT) was performed with a ProCon X-Ray GmbH CTAlpha, a 160-kV transmission tube from Feinfocus Garbsen and a Hamamatsu Photonics K.K. C7942SK-05 detector. The operating parameters were 160 kV voltage, 180 μA amperage, and 13.1 W target power. Data processing was performed using Volex 6.0 (Fraunhofer Entwicklungszentrum Röntgentechnik Fürth) and visualization was carried out with VG Studio Max 2.1. The X-ray diffractometry analysis (XRD) was employed to identify single mineral phases in a powder sample. The analysis was carried out using a FPM/Seifert URD 6 with a cobalt tube. The statistical interpretation and illustration was realized using the program ANALYZE (Seifert-FPM). The hydrothermal chimneys in the Eyjafjörður region show a complex architecture and a large number of potential pathways for hydrothermal waters. Their macrostructure is quite diverse ranging from several millimeters to nearly 45 m at the main cone Strýtan (Fig. 1d). Active discharge of hot water is a common feature (Fig. 1c, e, f). It is well visible due to the high thermogradients between the hot hydrothermal water and the subarctic low-temperature seawater. The contrast in density causes the formation of schlieren in the water column above the discharge points (Fig. 1e, f). According to Marteinsson et al. (2001), the chemical composition of the discharging fluids is identical with that of geothermal waters in springs and wells onshore. These are very sparsely mineralized (290 µS/cm) with a pH of 10, but contain about 90 mg/l Si. The rock sample from the major cone Strýtan investigated (Fig. 2A) is of the size 90 × 50 × 60 mm. It consists of a relatively soft mineral precipitate, which has a pale grayish, whitish to grayish beige color. It appears whitish-yellowish to brownish-grayish (II-Pol) or dark gray to black (X-Pol) under the microscope. The fine crystalline to homogenous fabrics are characterized by numerous parallel arranged, small-scale tubes (cf. Figure 2F; horizontal and vertical specimens) and show an estimated pore space of up to 25% (thin section counting). The porosity analysis (calculated from XCT investigations) reveals a large amount of available pore space in the sample. The pore volume ranges from approximately 2 up to 6 mm3 per pore. Relatively few small pores have developed in the sample, whereas predominantly large pores with volume around 6 mm3 prevail. The spatial distribution of the pores is relatively homogeneous (Fig. 2B–D). The walls of the pore space are partly coated by a pale brownish (II-Pol) salvage, which appears microcrystalline to banded with pale brown interference colors. This mineral also occurs in the form of impregnations or accumulation. An internal stratification of the sample is macroscopically visible (Fig. 2A). The single layers are 0.5–1.5 cm thick and represent overgrowth of mineral phases. Transitions between these growth stages are relatively sharp. The layers themselves appear smooth and gently curving. Marteinsson et al. (2001) also reported an “inner” and an “outer zone” of the small chimneys they investigated (Fig. 2E). Obviously, these zones represent the growth stages discussed here. Optical microscopy and SEM analysis show an overgrowth of minerals on micrometer scale (Fig. 3). The results of chemical analysis (XRF, Fig. 4; Table 1) show that the sample is dominated by the elements Si, Mg, Ca, and Al. Also Fe, Cl, and K are common. All other elements only occur in minor concentrations below 0.01 wt%: Ti, S, Ga, Sr, P, Mn, La, Ta, Ba, Br, Ge, As, Zn, I. Ni. U, Cu, Zr, Sb, Te, Rb, Y, Mo, Sn, Hg, and Th. The elements V, Cs, Co, Ag, Cd, Ce, Cr, Hf, Tl, Bi, Pb, W, Se, and Nb were below the respective detection limit which is given in Table 1. Neither anhydrite nor sulfides could be detected, although they are common minerals in hydrothermal chimneys (cf. Marteinsson et al. 2001). The overgrowth of mineral phases in the sample is also visible in its chemical composition. This is proven by the EDX line scan shown in Fig. 3. It confirms the presence of different materials, although no mineral phase identification is possible by the use of this method. The outer parts (Phase I) are characterized by a dominance of Si, Mg, and O. In the inner parts (Phase II), the elements Ca and O prevail. According to the results of XRD analysis (Fig. 5), the material consists mainly of a trioctahedral phyllosilicate of the smectite group, presumably saponite (cf. Geptner et al. 2002), which has the chemical formula Mg3[(OH)2|(Si,Al)4O10]·(Ca,Na)x(H2O)y.
Additionally, aragonite (chemical formula: CaCO3) and hisingerite (chemical formula: Fe 2 (III) Si2O5(OH)4·2H2O) seem to be present. Furthermore, the optical microscopy showed disperse to nest-like arranged microcrystalline aggregates of plagioclase, glasses/opaque minerals, and biotite. A precise characterization of all mineral phases necessitates further intensive clay mineralogical investigations, which were not in focus of our work. An attempt was made to simulate the formation of saponite by means of thermodynamic modeling of the mixing of the geothermal fluid with the surrounding ocean water. Only the Hatches database (https://www.oecd-nea.org/tools/abstract/detail/nea-1210) contains specific data about saponite minerals such as saponite-Ca, saponite-Mg, saponite-K, saponite-Na, and saponite-H. However, preliminary simulations showed that the geothermal fluid reported by Marteinsson et al. (2001) is extremely oversaturated (saturation index, logarithmic) with respect to all saponites (SI ~ 20). Oversaturation was calculated for ocean water as well (SI ~ 4). From this, it is obvious that the precipitation of saponite is inhibited and a catalyst is needed (Schumann et al. 2012). It can be speculated that the catalyst is provided by the ocean water and temperature may play a role as well. Apart from that, thermodynamic calculations cannot help clarify the formation processes in this case. The hydrothermal chimneys Strýtan discharge fluids actively. Thus, it can be speculated that mineral precipitation is ongoing and cones are growing. The mineral precipitate is deposited in centimeter-thick layers. This indicates nearly constant depositional conditions during the formation of each layer. Generally, minor changes in a limited region of the depositional system during times of statistically constant conditions result in the formation of layering (Collinson et al. 2006). Consequently, episodic changes in the depositional system might have led to the stratified architecture. Growth rates of single layers are at the moment completely unknown and cannot be discussed in detail here because the investigations did not consider any observations along a timeline. The main controlling factors of deposition are the supply of hydrothermal fluids (volume flow) and their geochemistry. Changes can be caused by varying volcanic activity. In times of increased volcanism, probably more fluid is emitted due to an increased amount of thermal energy and a rise of pressure in the system. Consequently, more mineral precipitates can be produced resulting in thick growth stages. In contrast, thin layers probably develop in times of decreased volcanic activity. However, this process could only have an indirect influence, as the emitted waters are assumed to be terrestrial freshwaters migrating along fractures while being heated on their way through the bedrock (Marteinsson et al. 2001). While macroscopic growth stages indicate episodic times of constant depositional conditions, microscopic layering actually indicates an intermittent deposition with short time changes or alternating conditions. Possible mechanisms are changes in seawater composition or in water dynamics (pressure), mixing and/or stratification of the water column (currents, tides), and changes in temperature or salinity. However, mineralogical processes such as (de-)carbonatization, silicification, or alteration may lead to small-scale differences within the growth stages (c.f. Okrusch and Matthes 2014). Hot spring silicification (e.g., Jones and Renaut 2011) is an especially common feature. Often, microbial activity influences this process (e.g., Konhauser et al. 2004). In the present case, secondary silicification might influence the primary mineral phases too (see Fig. 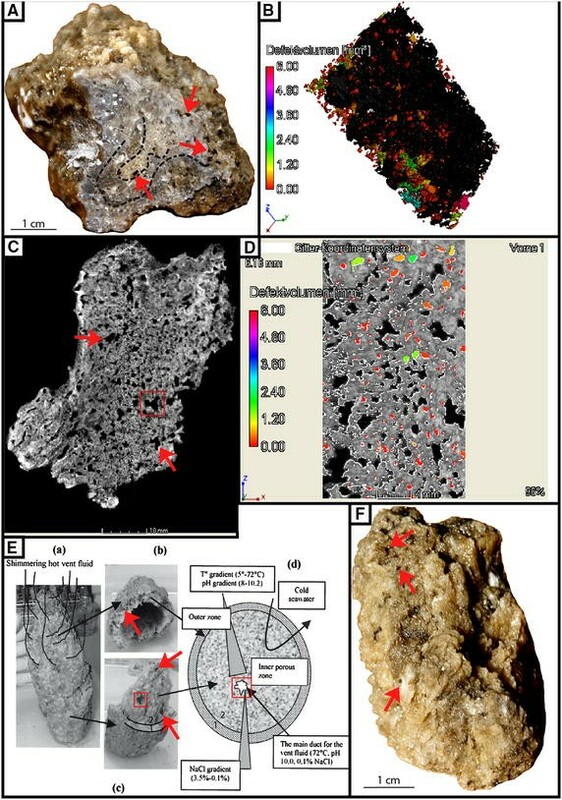 3) as the hydrothermal fluid discharged is rich in Si (Marteinsson et al. 2001). The pale brownish (II-Pol) secondary mineral phase in the pore space, most likely an iron oxide or hydroxide mineral precipitate, possibly suggests a post-sedimentary impregnation by migrating water phases with a different (iron-bearing) chemical composition. The sedimentation as well as the hydrodynamic and hydrochemical processes forms a highly dynamic depositional environment at the hydrothermal chimneys of Akureyri Bay. Depositional rates and chemical variations cannot be determined over long periods at the moment. Such knowledge would give further insights into the processes of sedimentation and alteration. Therefore, long-term observations and measurements of the hydrothermal discharge features should be performed to produce more useful data on the processes taking place. Additionally, a comparison of the system to another location would give new insights into the processes taking place. At first glance, the Lost City hydrothermal field at the Atlantis Massif could comprise a similar system, but the Lost City hydrothermal field is characterized by carbonates precipitating on a peridotitic lithology characterized by intense serpentinization (e.g., Früh-Green 2003; Kellley et al. 2005, 2007). In contrast, the Strýtan chimney provides smectite group minerals and the base rock is basaltic. 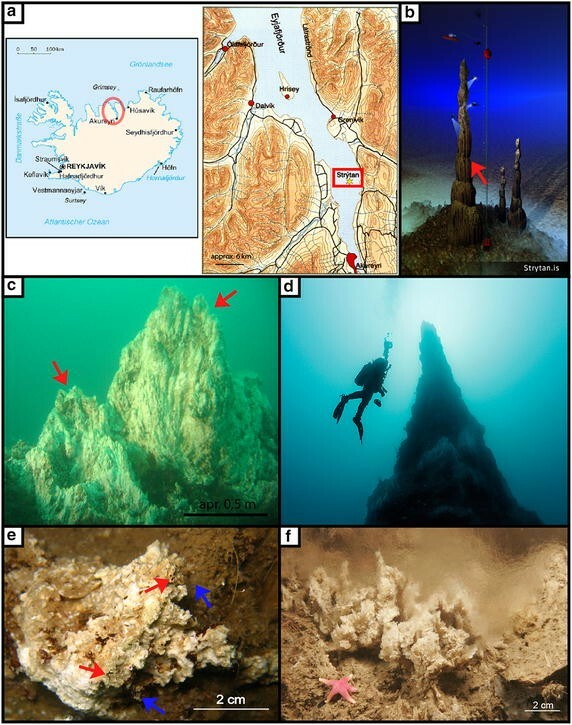 Moreover, the Lost City chimney is situated in a deep-sea environment (e.g., Kellley et al. 2005, 2007) which makes a comparison to the shallow marine Icelandic system difficult in general: ambient pressure, temperatures, illumination, and many other physico-chemical and biological parameters vary significantly. For sure, the overall appearance (“habitus”) as well as some geometric data (height of chimneys) might be comparable. However, the mineralogical and (water-) geochemical properties are completely different. To our knowledge, there is no comparable system to the Strýtan chimneys documented. Therefore, our study tries to complete the knowledge inventory about Strýtan which is the presumption for a substantive and meaningful comparison to other sites. The findings of geological investigations at the hydrothermal chimneys Strýtan in Northern Iceland presented in this publication contribute to the analysis of sedimentary processes in hydrothermal discharge structures. The results of in situ observations as well as of the structural, geochemical, and mineralogical analysis showed that the constructive processes at Strýtan hydrothermal cones act synsedimentary: a water discharge supplies hot, very sparsely mineralized hydrothermal water with a relatively constant water flow. When hydrothermal fluids come into contact with the cold subarctic seawater, it triggers catalytic-driven precipitation of smectite group minerals and other minerals. In the long term, elongated structures growing from the sea bottom are formed. The sample material shows a highly porous architecture, as it is built up of numerous small tubes. These constitute the waters’ pathway from the hydrothermal reservoir to the subarctic ocean water. Submarine hydrothermal discharge is often difficult to detect, especially in case of small and disperse venting. It is probably far more common than currently known. There are numerous coastal areas in shallow waters impacted by volcanisms, where comparable discharge of geothermal fluids is likely. A further study, e.g., about flow rates of the discharge at Strýtan could help understand such systems much better. Due to its position in a shallow water environment and the possibility of in situ investigations by scientific divers, this hydrothermal discharge feature is of enormous scientific interest as it may represent an analogue to comparable deep-sea systems, which are far more difficult to investigate due to the water depth at which they occur. Fieldwork and measurements were carried out by RST and CST. EB contributed during the fieldwork and with permissions for diving and sampling as well as with illustrating material and local information. BM attempted the thermodynamic modeling and contributed on hydrogeological and chemical issues. TP contributed to the geological model and biological issues. All authors contributed to discussions according to their respective areas of expertise. RST and CST drafted the final manuscript. All authors read and approved the final manuscript. We thank Dr. Kleeberg for help with the XRD analysis. Furthermore, thanks go to Dipl.-Ing. Uta Ballaschk for XCT analysis, to Dr. Jörg Pfänder for the geochemical advices, and to Prof. Dr. Klaus Stanek and Anja Obst for SEM and EDX analyses (all TU Bergakademie Freiberg). Last but not least, we thank the anonymous reviewers for their review and useful comments to improve the manuscript. Data can be obtained via science@geowid.de or on ResearchGate.